Longitudinal lines, or striations, may appear as indented grooves or projecting ridges (Figures 3.1-3.16). 1 Grooves with a physiological cause appear as shallow and delicate furrows, usually parallel, and separated by low, projecting ridges. 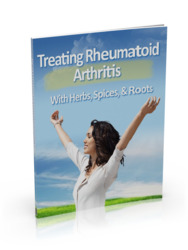 They become more prominent with age and in certain pathological states, such as lichen planus, rheumatoid arthritis, peripheral vascular(arterial) insufficiency, Darier's disease and other genetic abnormalities. 2 Onychorrhexis consists of a series of narrow, longitudinal, parallel superficial furrows with the appearance of having been scratched by an awl. Sometimes dust becomes ingrained into the nail surface. Splitting of the free edge is common. 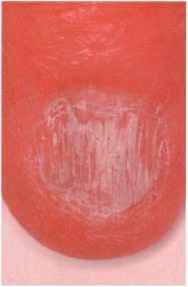 Onychorrhexis reflects severe nail matrix damage and is quite typical of nail lichen planus (Figures 3.6, 3.7). It is also observed in lichen striatus where it is limited to a heminail. It may be an early sign of systemic amyloidosis; where it is often associated with splinter haemorrhages. 3 Tumours such as myxoid cysts and warts in the proximal nail fold area may exert pressure on the nail matrix and produce a wide, deep, longitudinal groove or canal, which disappears if the cause is removed (Figures 3.8, 3.9). 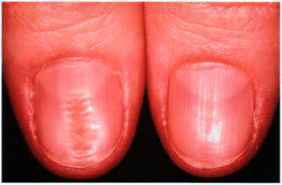 4 Median nail dystrophy (Figures 3.10, 3.11) is an uncommon condition consisting of a longitudinal defect of the thumb nails in the midline or just off-centre, starting at the cuticle and growing out of the free edge. It may be associated with an enlarged lunula. In early descriptions, the base of the 2-5 mm wide groove with steep edges showed numerous transverse defects. 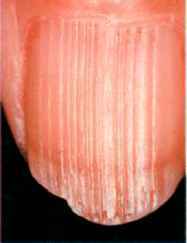 In some cases median longitudinal ridges have been observed, occasionally combined with fissures and/or a groove, developed from the distal edge of the nail plate to the matrix. Often a few short, feathery cracks, chevron-shaped, extend laterally from the split—the 'inverted fir tree' appearance. The so-called naevus striatus symmetricus of the thumbs corresponds to this form. 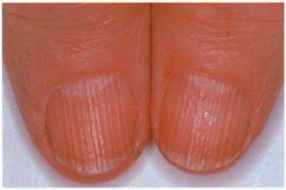 Median nail dystrophy is usually symmetrical and most often affects the thumbs. Sometimes other fingers are involved, the toes less commonly (usually the great toe). After several months or years, the nail returns to normal but recurrences are not rare. Familial cases have been recorded. The aetiology is unknown, although it has been suggested that it is due to self-inflicted trauma resulting from a tic or habit (Figures 3.12, 3.13). Treatment of recalcitrant cases may be identical to that for post-traumatic nail splitting. 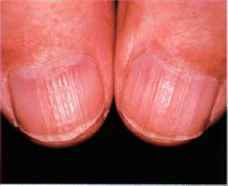 5 A central longitudinal depression is found in 'washboard' nail plates, caused by chronic, mechanical injury (Figures 3.14-3.16). 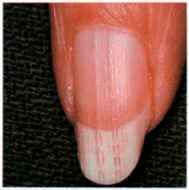 Unlike median nail dystrophy (Heller's dystrophy), the cuticle is pushed back and there is accompanying inflammation and/or thickening of the proximal nail fold. Splits due to trauma, or those occurring in the nail-patella syndrome and in pterygium, are usually obvious. 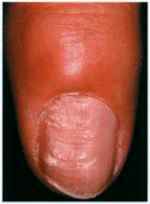 Longitudinal splits may also result from Raynaud's disease, lichen striatus and trachyonychia. 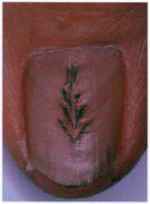 Nail wrapping (see Chapter 9) may lessen the disability produced by the fissure; the proximal nail fold must be protected from repeated minor trauma. Longitudinal lines associated with old age. Longitudinal lines in a patient with rheumatoid arthritis. Longitudinal lines—old age 'sausage link' appearance. Longitudinal lines—prominent old age changes, which may occur earlier with chronic arterial impairment. Longitudinal dystrophy in lichen planus. Mild onychorrhexis in lichen planus. (a, b) Severe onychorrhexis and nail thinning in lichen planus. 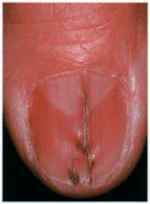 Longitudinal nail groove due to (a) glomus tumour, (b) myxoid cyst, (c) fibrokeratoma. Myxoid cyst—longitudinal groove and Beau's lines. Heller's median canaliform dystrophy (Leclercq's variant). 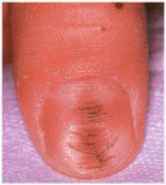 Onychotillomania—median nail dystrophy of several nails. 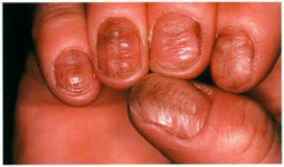 Onychotillomania—severe median nail dystrophy of the thumb and third finger nail. Central longitudinal grooved dystrophy, self-induced by trauma to the matrix. Unilateral central longitudinal grooved dystrophy. Small rectilinear projections extend from the proximal nail fold as far as the free edge of the nail, or they may stop short. They may be interrupted at regular intervals, giving rise to a beaded appearance. Sometimes a wide, longitudinal median ridge has the appearance, in cross-section, of a circumflex accent. The condition is inherited and affects mainly the thumb and index fingers of both hands. Table 3.1 shows the principal causes of longitudinal lines and grooves. 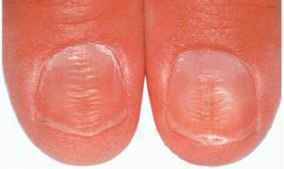 Is longitudinal lines nails and rheumatoid arthritis linked?